The Vitasalus™ PureMaster™ V-Series™ V-300™ Replacement Media includes two bags of NSF® certified high-grade PureCarbon™ and PureCat™ water filtration media weighing a total of approximately 30 pounds. PureCarbon™ is a high-grade, medium-granule NSF® certified Virgin Coconut Shell Granular Activated Carbon. PureCat™ is a high-grade, small-granule NSF® certified Catalytic Virgin Coconut Shell Granular Activated Carbon. The Vitasalus™ PureMaster™ V-Series™ V-500™ Replacement Media includes two bags of NSF® certified high-grade PureCarbon™ and PureCat™ water filtration media weighing a total of approximately 45 pounds. PureCarbon™ is a high-grade, medium-granule NSF® certified Virgin Coconut Shell Granular Activated Carbon. PureCat™ is a high-grade, small-granule NSF® certified Catalytic Virgin Coconut Shell Granular Activated Carbon. The Vitasalus™ PureMaster™ V-Series™ V-700™ Replacement Media includes two bags of NSF® certified high-grade PureCarbon™ and PureCat™ water filtration media weighing a total of approximately 60 pounds. PureCarbon™ is a high-grade, medium-granule NSF® certified Virgin Coconut Shell Granular Activated Carbon. PureCat™ is a high-grade, small-granule NSF® certified Catalytic Virgin Coconut Shell Granular Activated Carbon. The Vitasalus™ FluorideMaster™ Replacement System includes the Ready-To-Install FluorideMaster blue tank unit, media, and an inlet and outlet head. The Fluoride Master system utilizes high-grade FluoriSorb™ media and is designed to completely remove or significantly reduce fluoride (commonly found in city/municipal water supplies), sediment and/or particulate matter from all of the water entering your home for about 400,000 gallons or 4–6 years. The FluorideMaster system utilizes approx. 60 pounds of high-grade FluoriSorb™ media (known as Hydroxyapatite/Bone Char) which is considered to significantly outperform other fluoride reduction media such as "activated alumina". 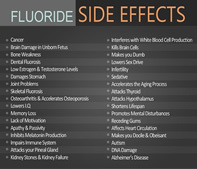 The FluorideMaster does not contain any "activated alumina". NOTE: The replacement system option is typically for existing FluorideMaster owners.